Can a Brand Be Viral? Two events that epitomize the wonkiness of the media industry took place at The New York Times this month. First, the Times published a scathing two-piece series about the deplorable working conditions and health risks faced by those who work at nail salons. The story, about 2,000 total words of wonderful investigative journalism, went viral. Three days after the first nail salon story published, the Times announced it was going to let Facebook directly host its articles. In the week these two events happened, the latter held more gravity for me as a media professional. An increasing share of news is consumed via mobile devices — more than half of the Times’ web traffic comes from mobile devices — and a lot of that traffic comes from Facebook, which has over a billion users. At the simplest level, the Times’ partnership with Facebook is just another distribution channel, but one must consider how that distribution takes place. When a Facebook user clicks on a Times story, that story was presented to it either because a friend shared it or Facebook’s algorithms guessed that the user would be interested in it; neither of those processes entail any editorial judgment beyond the Times’ decision to publish the story. Contrast that with a homepage or a print edition. Unlike on a Facebook feed, each story is ranked on a hierarchy of importance determined by an educated, news-savvy staff that has spent years, in many cases decades, determining what is important. If that decision is left to friends and Facebook algorithms, which are more closely tied to an advertising department than is any newspaper editorial staff, a consumer is more likely to get the news he or she wants to read, not what he or she should read. Publishers — big, important publishers, mind you — were quoted in the Times article saying they were trying Facebook hosting out, in large part because they need the eyeballs to sell more ads. That outcome will surely take place, but at what expense to the brand? 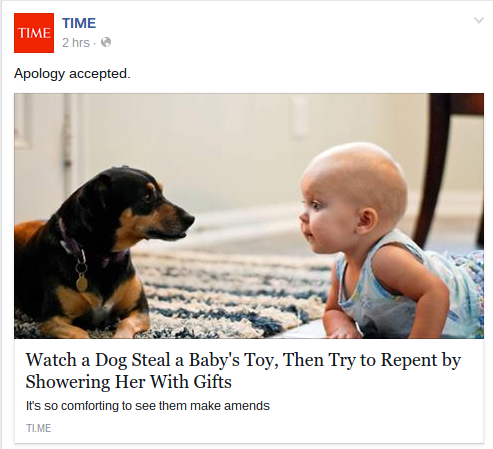 I criticized Time‘s avoidance of newsworthy stories (and promptly unfollowed it), but can you blame the magazine for posting the stories that will elicit the most clicks? In an era where consumer stumble upon stories via social media rather than targeting the homepages of trusted brands, doesn’t a company have to throw a little clickbait in there to keep the lights on? It’s easy to argue yes, but this is where the Times’ nail salon story comes into play. This was a story about nail salons in New York City, but the piece went viral nationwide. The reason? It was damn good, very well reported, and touched on a seemingly familiar aspect in many of our lives. Every person who read that story will now wonder about the treatment of the workers inside their local nail salon, even if they live outside New York. Good journalism can still go viral. It doesn’t do so reliably, but it’s possible. 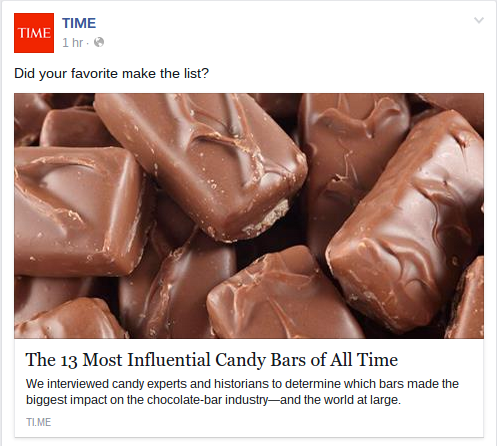 Thus, the Times might not have to pander to Facebook’s algorithms quite like Time has, but that could change. If the brand has no weight, a publication’s success relies entirely on the one-off success of its stories, and letting social media like Facebook directly host stories hinders the gravity of a brand. More publications will surely partner with Facebook; what will be more interesting is to see if they stick with it.